When we raised McHale’s No. 32 to the rafters, naturally, we assumed his last great Boston moment happened in a ’93 playoff series against Charlotte, when McHale reached back in time and tortured the Hornets down low for 35 unfathomable points in Game 2. 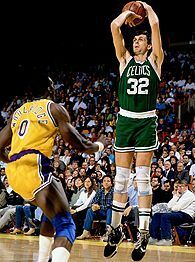 The Garden was rocking, McHale was moving like the old McHale and everything seemed right with the world again. It was one of those ESPN Classic games that you knew you’d always remember even as it was happening. And if that had been his last great act for the Celtics, I would have been fine with it. Fast-forward to 2007. The Celtics haven’t mattered in 15 years. We’ve won three playoff series since McHale retired. We’ve had three above-.500 seasons. We’ve had terrible front-office executives and terrible coaches, people who were so horrendous at their jobs it almost defied belief. We’ve had a whopping two All-Stars, neither of whom was a top-10 player (although they were paid like it). Quite simply, we’ve sucked. Even worse, the people running the team were panicking like a teenage couple waiting for the results of a pregnancy test, culminating in last month’s bizarre decision to trade the No. 5 pick for Ray Allen. We were stuck in no man’s land, just good enough to make the playoffs, just young enough that we weren’t making noise, and by the time our young guys matured, Allen would have been finished. For the past four weeks, I’ve probably been the angriest I’ve ever been at my favorite team. Our old friend Kevin McHale. My NBA guide claims that McHale retired from the Celtics in 1993, but apparently that’s a misprint. How else could you explain his decision to trade Kevin Garnett to Boston for the Al Jefferson pu pu platter deluxe? Just five weeks ago, McHale and Minnesota couldn’t close a potential deal in which they received Jefferson and Boston’s No. 5 pick. Now? They’re settling for Jefferson (a potential franchise player), Ryan Gomes (an intangibles guy who’s useless on a bad team), Bassy Telfair (a year away from signing in Italy), Gerald Green (a homeless man’s J.R. Smith), Theo Ratliff’s expiring deal, a 2009 lottery-protected No. 1 pick (congrats on picking in the mid-20s) and the return of Minny’s future No. 1 that was stupidly included in the Ricky Davis/Mark Blount-Wally Szczerbiak trade. Basically, McHale traded one of the best 25 players ever — at the tail end of his prime!!! — for Jefferson (a free agent in two years), one year of Gomes (a free agent in ’08, when he’ll be leaving treadmarks on his way out of Minnesota), a harmless pick and a do-over for a pick he never should have traded. Last month, McHale walked away from the No. 5 pick in the deal. This month, he couldn’t even get Boston to throw in Rajon Rondo. And honestly? I’m flabbergasted. I was vehemently against trading Jefferson and the No. 5 for KG, only because losing Jefferson wouldn’t have been worth competing with two top-25 guys and a roster too young to do anything around them (as well as Doc Rivers coaching that very same team). Now? They have three All-Stars — KG, Allen and Paul Pierce — who rank in the top-six at their respective positions. Assuming KG and Allen have 2-3 quality seasons in them, that gives the Celts pole position in the atrocious Eastern Conference for 2008 and 2009, especially if they luck out with one more free-agent signing and an in-season veteran pickup. Now here’s where it gets really good: Pierce, Allen and Garnett happen to be wired the exact same way — three ultracompetitive guys nearing the end of their primes who would sacrifice anything to play on a winner. All of them were stuck in miserable situations last season (combined record: 87-159), all of them are good guys, all of them understand that you only have so many chances to contend. For all three guys, it will be their best team ever, regardless of who’s playing with them. Allen hasn’t played with a top-20 player his entire career; neither has Pierce; and Garnett hasn’t played with one elite scorer, much less two. For Garnett, his major weakness (crunch-time scoring) gets solved with two proven crunch-time scorers helping him. For Pierce, his major weakness (leadership) gets obscured because he has two intense veterans who know how to deal with the media and lead by example. For Allen, his weakness (a tendency to break down) gets negated because he won’t have to carry his team offensively every night. 1. Minny is rebuilding around Jefferson, Corey Brewer, Randy Foye, Gerald Green and Ryan Gomes … ironically, the same core (along with Paul Pierce) that Boston could have had if it kept its last two first-round picks. So we get to see how it would have worked out if Boston hadn’t done anything. It’s like watching the Bizarro Celtics. Just think of these three guys thrown together. All three carried playoff teams further than they should have gone: Pierce in 2002, Garnett in 2004, Allen in 2005. All three were on suicide watch as recently as six weeks ago, wondering how they could extract themselves from untenable (and unwinnable) situations. All three are about to become relevant again in April, May and June. Would you bet against them having monster seasons? Would you bet against them embarking on a 100-game mission to make the Finals? Hell, have three star teammates ever had more to prove in one season? There’s one precedent: In August 1996, when the Rockets mortgaged their future by trading Sam Cassell and Robert Horry to the Suns for Charles Barkley, teamed the Chuckster with Hakeem Olajuwon and Clyde Drexler and crossed their fingers that a paltry supporting cast (basically, Eddie Johnson, Mario Elie and a gigantic hole at point guard) wouldn’t sink them. Although Dream and Glide already had won titles, their careers were at a similar point as the KG-Pierce-Allen trio — each (including Barkley) had peaked as impact players, but each had something left in his tank. Dream averaged a 23 points and 9 rebounds, Barkley recorded 19-13.5, Drexler chipped in with an 18-6-6, and the Rockets won 57 games and came within two victories of the ’97 Finals, losing to the Jazz for one reason: Rookie point guard Matt Maloney was absolutely eviscerated by John Stockton. This was like watching Frankie Williams get destroyed by Roddy Piper on Piper’s Pit, only if it happened for six straight games over the course of two weeks. That’s why they lost. One year later, Glide and Dream were just about done, Barkley was headed that way and the Rockets finished .500. They haven’t won a playoff series since. The question remains: If you’re a Rockets fan, would you make that trade again? You had that Utah series tied 2-2 before blowing a nailbiter in Utah and losing Game 6 on a Stockton buzzer-beater. You were right there. Was it worth it? In my opinion, absolutely. The whole point of fielding an NBA team is to win a title — if you have the chance, you have to try. Even if it means crossing your fingers with the likes of Matt Maloney. Eleven years later, the Celtics find themselves in a similar spot: Three All-Stars coupled with a talented but woefully inexperienced point guard (Rondo), a promising defensive stopper coming off major knee surgery (Tony Allen), a decent backup center who plays hard (Kendrick Perkins), a new Mark Madsen for KG (Brian Scalabrine, who’s already working on his high-fives and fist-pumps), two undersized power forwards (Big Baby Glen Davis, Leon Powe), two athletic rookies (Brandon Wallace, Gabe Pruitt) and that’s it. There isn’t an Eddie Johnson or Mario Elie to be seen. Then again, since they’re likely to add one or two more ring-hungry veterans, and since the ’08 Eastern Conference is between three and 200 times worse than the ’97 Western Conference, who knows? In the words of Chris Shiherlis, the bank is worth the risk. 1. One sad part of the trade — poor Al Jefferson getting exiled to Minnesota to play for an awful team in a tough conference loaded with good power forwards, and if that’s not bad enough, he has to play with Ricky Davis and Mark Blount again and replace the most popular player in T-Wolves history. Yikes. With that said, I still think he’s a potential franchise player. 2. Word on the street is that Pierce lobbied KG relentlessly over the past four weeks to change his mind about coming to Boston. And it worked. Two other things helped: The Allen trade increasing Boston’s playoff chances, and Phoenix/Chicago refusing to blow their teams up for KG. So if you’re scoring at home, black guys do want to play in Boston — as long as it’s for a playoff contender and they have no other options. 3. Chicago fans, you should be bummed — KG would have ended up in Chicago if John Paxson had simply rolled over P.J. Brown’s expiring deal last February for a 2008 expiring deal to preserve that cap number (like Phoenix wouldn’t have been interested???). A. Coming up with a rotation and sticking to it — not a problem now since the Celts barely have enough NBA guys on the roster. B. Killing the confidence of his point guards by yelling at them too much and yanking their minutes around — not a problem now since Rondo is the only point guard on the roster. C. Refusing to come up with any semblance of a strategy to defend high screens — not as much of a problem now because KG is one of the greatest pick-and-roll defenders of all-time. So maybe Doc won’t be as much of an albatross this season. Besides, any team with KG, Pierce and Allen will coach itself. We can only hope. Regardless, at least the Celtics matter again. From the beginning, Danny Ainge’s stated game plan was to blow up a decent 2004 team, stockpile as many assets as possible, then eventually trade those assets for one or two impact guys. In a roundabout way, that’s exactly what he did — even if the Allen trade was a complete I-need-to-save-my-job panic deal, and even if they gambled that a third All-Star miraculously would fall from the sky this summer (which is exactly what happened). Looking back, it was like watching the World Series of Poker and seeing someone say “screw it!” by going all-in with a jack-nine of diamonds after a flop yielded two more diamonds. Is it smart to risk everything on the 25-percent chance that you’ll get the flush? Well, it depends on how many chips you have left. If you’re desperate, and you’re running out of money, and you need a momentum swing, maybe you do it. If you get the flush, it doesn’t mean you were a good poker player, it just means you were losing chips and had to take an enormous risk because you didn’t have any other choice. For Ainge, the Allen trade was going all-in for the flush and the KG trade was getting that fifth diamond on the river. Of course, he’s also the reason we were low on chips in the first place, but that’s the thing about poker — even during the most dire times, you’re always one lucky hand away from turning things around. For one of the few times since Larry Bird retired, the Celtics lucked out. Now it looks like they can contend in the East. Now the Celtics are on TNT and ESPN for more than two appearances. Now Barkley and Kenny aren’t making jokes about us, and free agents actually might want to play for us, and my dad isn’t bemoaning the fact that he just threw away money for season tickets again. The Boston Celtics are back. Repeat: The Celtics are back. Even if we had to give up two top-seven picks and the best young low-post player in the league to get there. We were on the phone going through the trade, piece by piece. Dad loved watching Jefferson. He thinks Jefferson is going to be special. At the same time, he’s getting old and wanted to see them contend again. At the very least, we’re contenders. That much is clear. You actually can look forward to Celtics home games again.